Event List—A nearly complete list. Conifer specimens collected from the Canada and the United States over the past century. Digitise Australia’s largest collection of insects! Your participation will help our researchers understand Australia’s unique fly biodiversity. During this one-day event at Kew, you will help us unlock information held on the Fungarium shelves and make it widely available to everyone. Scientists here and around the world need your help! Join us in transcribing scientific labels from our collections. You will be transcribing collection information from our herbarium specimens whilst interacting with other institutions across the globe. Create digital data about plant specimens collected in Florida over the past 200 years for the benefit of science, society, and our flora. Students will help digitize specimens as part of coursework in two courses, Botany and Dendrology. WeDigBio @ Yale will focus on transcription of labels of plant specimens housed in the Peabody's herbarium. Refreshments will be provided! "Sedges have edges" is a helpful mantra in plant ID to spot this tricky group. Try learning Virginia's sedge diversity with this expedition! 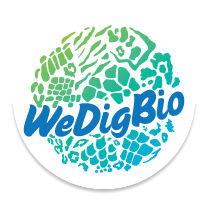 This WeDigBio event is part of the Broader Impacts class at UF. Event to help transcribe plant specimens housed at Howard University, especially from the Mid-Atlantic region. Learn to mobilize biodiversity data from preserved plant specimens collected in Hawai‘i to advance scientific research & support conservation! WeDigBio at Meise - This multilingual platform allows volunteers to help us digitize herbarium labels in Dutch, French, German and English. If you can do basic data entry, you can help FALAFEL digitize the Fungal Herbarium of the Florida Museum of Natural History!